crikey what an amazing wee curly creature.... I have days when I'd love to be able to curl up like that. I can't understand how anyone could possibly be mean to this little chap. Wow, amazing creature. Thank you for sharing all this with us. aww he reminds me of MC Escher's "Wentelteefje" (Curl-Up)! It's a bit Armadillo like. And shy too by the looks of it! What an odd looking critter! 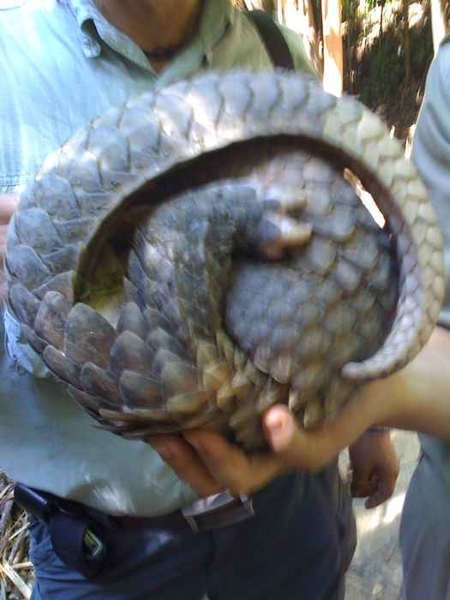 Stephen Fry So how much _is_ a Pangolin in the hand worth? First thing that came to mind: Sonic the Hedgehog, only not blue. For some reason, the critters have always reminded me of artichokes with legs. Oh! I love pangolin! Possibly the most adorable little armor-plated creatures! I assume there is a head in there somewhere but I imagine he has good reason to hide it. It has the surreal quality of a Tenniel illustration from one of the Lewis Carroll Alice books. that's so cute! aaw! which means he's probably quite vicious, it's always the way. shy, but, not exactly a cuddly bundle of joy, is it? Why did I expect it to be a musical instrument? It looks like one of the creatures from Alien! Armadillo, crunchy on the outside, chewy on the inside!! Looks like some of the strong-willed women I referee. Little guy's a little camera-shy. He looks real cute.